The poster of Woody Allen’s Sleeper mocks James Bond. Rather than alluding to the suave-spy, it would’ve made more sense to note the influence of slapstick-star Charlie Chaplin. The playful, silent acting, set within a sci-fi context, serves to support a meeting of like-minded comedians as Woody Allen gets his closest to non-verbal, physical performance. Musician Miles (Allen) is frozen for 200 years, inevitably falling for Diane Keaton, as Luna Schlosser. Using actor Douglas Rain to provide a voice, as he did in 2001: A Space Odyssey, this is Allen leaning on sci-fi stimuli and using H.G. Wells and George Orwell as source material. 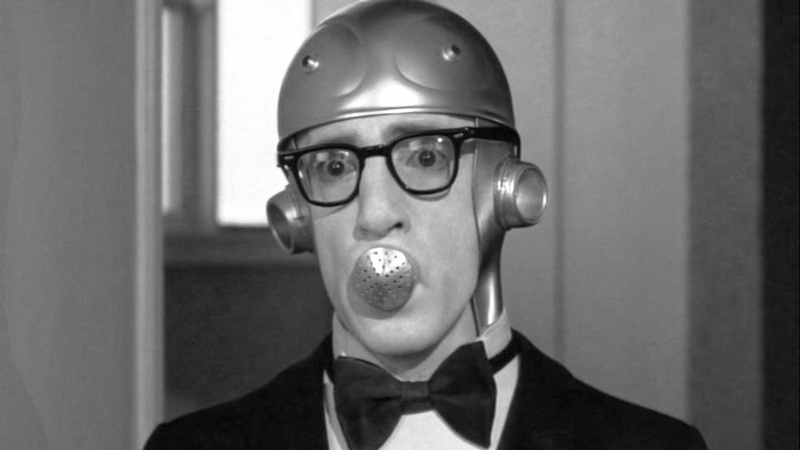 The tone is what established Woody in his early years, and his disguise as a robot (a plug in his mouth creating a motionless face akin to Buster Keaton) is amongst the best sequences in his career. Sleeper is solid, straight-up comedy without the intellectual chitchat. I love Woody Allen and even his earlier work ahve something that is true to him. Good write up!